Laboratory safety information is traditionally found using (Material) Safety Data Sheets, Standard Operating Procedures, literature (Bretherick's), and prior knowledge. However, the large number of resources can make it difficult for a chemist to find the most relevant information efficiently. By providing concise and relevant information to an experimentalist, critical risk assessment becomes faster, easier, and more accurate. 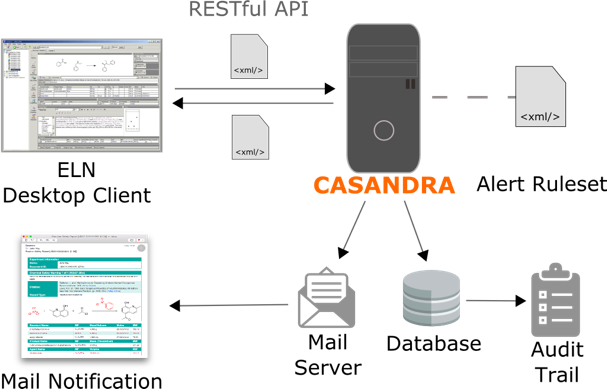 NextMove Software's Casandra is a server that provides real time alerting of reactive chemical hazards. The server is deployed to an internal network and is configured with an in-house warning set. Warnings are specified in a flexible XML format encoding a variety of conditions including occurrence of specific compounds, occurrence or count of functional groups, physical quantity thresholds, and logical combinations of the other conditions. Integration with NextMove Software's CaffeineFix technology provides chemical name spelling-correction and structure lookup. The server is intended to be used with an Electronic Laboratory Notebook (ELN) plug-in that sends reaction schemes to the server (when modified) and receives a response of identified hazards.